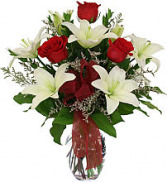 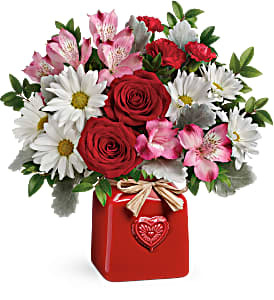 The Stunning Beauty™ Bouquet blooms with rich, bold blooms, making this a fresh flower bouquet that simply never goes out of style! 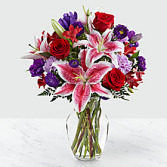 Fragrant Stargazer Lilies take center stage of this arrangement as they stretch their long star-shaped blooms across a bed of red roses, purple double lisianthus, lavender carnations, red Peruvian Lilies, purple daisies, and lush greens. 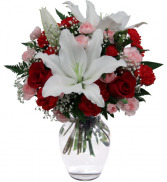 Presented in a clear glass vase, this gorgeous bouquet is created just for you to help you celebrate an anniversary, a birthday, or to simply say thank you.